Perfect for every cheese board. Suitable for vegetarians. Try a quirky combination of camembert and grapes on our Digestive Biscuit. Match whipped goats cheese & cranberry jelly beautifully with a Cornish Wafer®. Cheddars® can be paired perfectly with cream cheese & red chillies. Salt & Cracked Black Pepper Bakes can be perfectly matched with mozzarella & pesto. 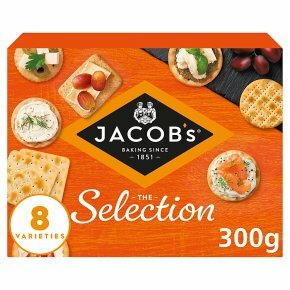 The toasted flavour of our Water Biscuits are perfect with soft cream cheese, dill & seasoning. Have you considered marrying our Sesame Carlton with feta chunks & sliced green olives? Table Crackers pair perfectly with red pepper hummus, cherry tomatoes & basil. A Cream Cracker & cheddar is a Best of British combination. Top it off with sliced tomatoes & chives.